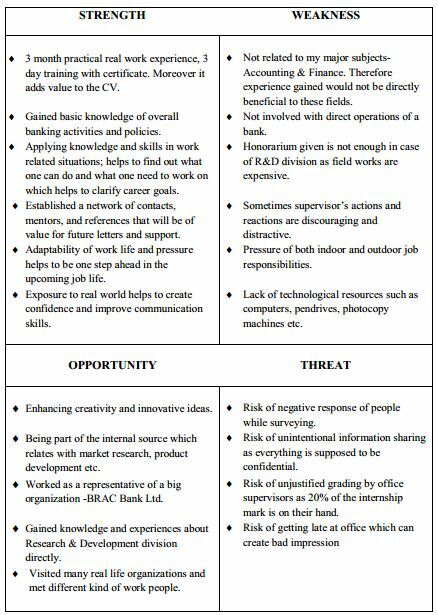 This paper is entitled “Evolving SME Banking in Bangladesh: through BRAC Bank Ltd and its comparison with other four banks’’, originated from the fulfillment of the internship program. This report has been made as a completion of academic requirement endorsed by BRAC business school, BRAC University. The principle goal of internship program is to assess student‟s ability for a particular career before choosing any career permanently and to provide an opportunity to converting theoretical knowledge to practical situation. It assists students to accommodate with the work environment. It is a three months long program in which students get opportunities to work in different business organizations, financial institutions, research institutions. Based on their working experience they have to make a project report. I had joined Research & Development division of BRAC Bank Ltd on 24th September 2012 and the internship period ended in 23rd December 2012. To review the importance of SMEs and its financing. To review the SME banking of Bangladesh. To review the importance of SMEs in the economy and the current status of SME financing in Bangladesh. To review the present role of regulatory authorities in SME financing and development. To review BRAC bank‟s contribution in SME Banking. To conduct a comparative analysis of SME banking in BRAC Bank and four other private commercial banks. 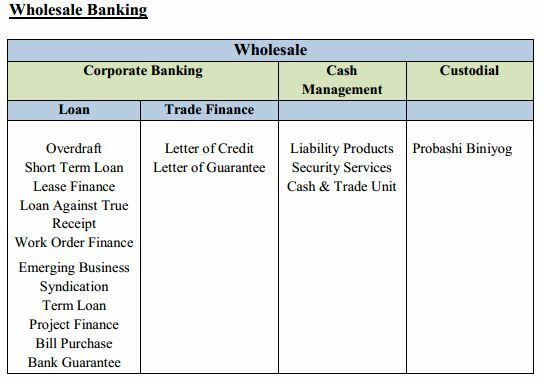 The report focuses on the comparative analysis of SME Banking of BRAC Bank with four other private commercial banks not the whole banking and non banking industry.Evolving SME Banking in Bangladesh: through BRAC Bank Ltd and its comparison with other four banks. 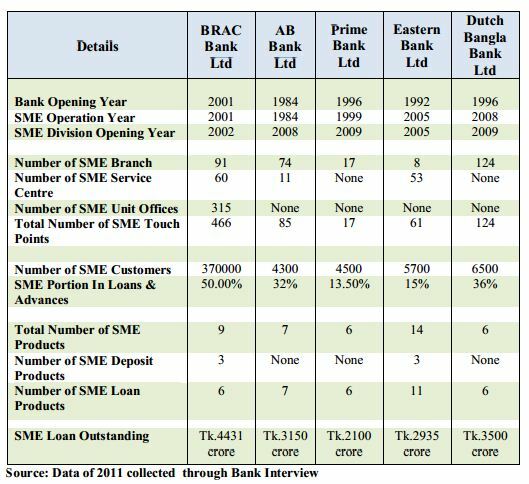 Evolving SME Banking in Bangladesh: through BRAC Bank Ltd and its comparison with other four banks. BRAC Bank is a scheduled commercial bank established under the Banking Companies Act, 1991 and incorporated as a public company limited by shares on 20 May, 1999 under the Companies Act, 1994 in Bangladesh. It is the last organization to have received a commercial banking license from Bangladesh Bank, making it the youngest private commercial bank in Bangladesh. BRAC, the largest private development organization of the world, believes that micro finance is an important tool in breaking the cycle of poverty. BRAC realized that there is a vast group of small and medium entrepreneurs in the country, who have no access to institutional credit. Upon realization BRAC introduced a full-fledged commercial bank- BRAC Bank, in July 2001. BRAC Bank Ltd has important international shareholdings apart from BRAC which are International Finance Corporation (IFC) and ShoreCap International Limited. According to the year 2011, the General Public holds the highest shareholding of 50% and BRAC holds the second highest percentage of ownership which is 43.77%. On the other hand, International Finance Corporation (IFC) and ShoreCap International Limited hold 5.36% and 0.86% of shareholding respectively. BRAC Bank is a fully fledged commercial bank; yet, it has significantly contributed in the development of SME sector by creating a unique model of collateral free SME lending, which enabled the SME entrepreneurs (the missing middle) to get easy access to finance. BRAC Bank SME finances covers a many non-traditional sectors – agriculture, food processing, light engineering, plastic, handicrafts, poultry, dairy, fishery, feed mill, wood processing, boutique & garments, which helps to boosting rural economy and generating employment. With 400 SME Unit Offices, BRAC Bank is strongly positioned to reach to small entrepreneurs at the nook and corner of the country realizing their dreams. VI) BRAC Saajan Exchange Limited. incorporated in Bangladesh in 2000 under the Companies Act 1994 in the name “Equity Partners Limited”. On 4 October 2009, the company changed its name to “BRAC EPL Investment Limited”. BRAC Bank Limited acquired 51% of its equity in August 2009. On 11 February 2010, a new merchant registration certificate was issued in favor of BRAC EPL Investment Limited which allows it to perform the activities of issue manager, underwrite and portfolio manager. BRAC EPL Investment Limited delivers a whole range of investment banking services including traditional merchant banking activities such as issue management, corporate advisory, and corporate finance to many of its clients. II) BRAC EPL Stock Brokerage Limited: BRAC EPL Stock Brokerage Limited was incorporated in Bangladesh on 16 May 2000, as a private limited company under the Companies Act 1994 in the name of “Equity Partner Security Limited”. The name of the company was changed to BRAC “EPL Stock Brokerage Limited” on 04 October 2009.
income securities, etc. it has corporate membership of Dhaka Stock Exchange Limited and Chittagong Stock Exchange Limited. 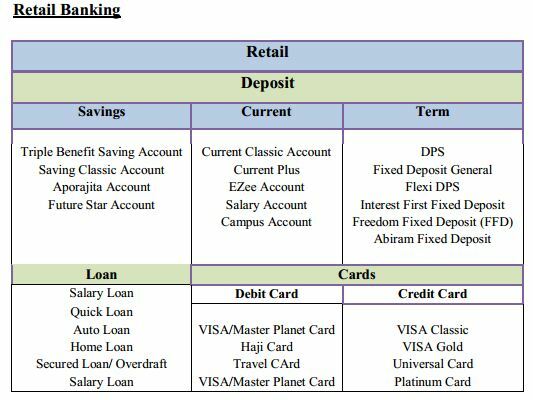 Evolving SME Banking in Bangladesh: through BRAC Bank Ltd and its comparison with other four banks. simple business model of ‘mobilizing deposits from urban areas and disbursing it to rural areas’, bKash is well ahead on its journey of financial inclusion for the ‘mass’ with its state-of-art technology and security. Limited – in Birmingham, United Kingdom. Non-Resident Bangladeshis (NRBs) from UK now have a secured, fast, online transfer option available for sending remittance to Bangladesh from UK. The company has been formed through acquisition of 75 % shares from the erstwhile Saajan Worldwide Money Transfer Limited by BRAC Bank Limited. The acquisition has strengthened our operation in the remittance market in UK. It‟s been reported that the company was able to successfully capture more than 10% of the remittance market in UK. a) BRAC Asset Management Company Limited: BRAC Asset Management Company Limited (the company) was incorporated in Bangladesh on 01 April 2010 as a private company, limited by shares vide certificate of incorporation no. C-83926/10. The principal activities of the company for which it was established include the business of investment and asset management, portfolio management, capital market operation, financial intermediary services, management and launching of mutual funds, fund management and sponsorship, merchant banking activities, etc. BRAC Bank Limited is the largest SME Bank in the country and 4th largest SME Bank in the world in terms of outstanding loan amount. It has been rated as one of the 4th successful & Sustainable SME banks in the world by the council of Microfinance Equity. It has acquired 1.3 million customers, bringing full banking services across not just SME, but all strata of the banking industry. It has managed and maintained the size of its corporate asset portfolio of over BDT 30 billion which is near about 27% of its portfolio. Its Offshore Banking Unit (OBU) grew by 147% in 2011 just in a year from BDT 1,841 million to BDT 4,544 million. Students should be allocated according to major subjects and area of interest. Interns should be treated well and supported in gaining knowledge and skills. Managers and Head of the division should be friendly and cooperative with the interns. Minimum percentage of the internship marks should be associated with the organization supervisor as there is a risk of unfair evaluation. R&D division should have a little bit more space where interns can seat as there are times when interns have to roan around in search of appropriate standing or seating place. R&D division should have more computers, pendrives, photocopy machines etc. BBL should emphasize more on employee‟s attitude. Trainings that consist of learning courtesy, positive attitude should be given to the employees. This would increase the customer satisfaction and employee quality. BBL should charge a bit low interest rate and other charges as this would attract more customers. Many existing and potential customers are discouraged by BBL‟s high interest charge and other charges. BBL should take customer complaints seriously and improve its service as this might create customers to move away if no steps are taken. economic recovery, generating employment and reducing poverty. 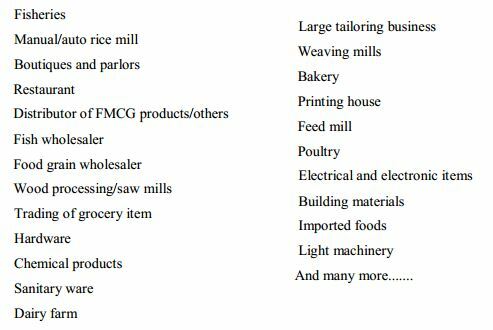 Financing is the foremost obstacle for SMEs followed by taxes, regulation and inflation.SME enterprises in Bangladesh essentially require financing for three purposes – for start-up, for working capital, and for fixed capital. Unavailability of working capital from formal financial institutions has been recognized as one of the major complaints of SMEs in Bangladesh (Meagher, 1998). High percentage of SME ventures in Bangladesh was depended on personal savings, family or other informal credit sources. In recognition of this failure of the financial market, attempts had been taken by few of the more established MFIs (Microfinance Institutions) who had scaled up to tap this market. ASA was one of the first NGOs to introduce its Small Entrepreneur Development Program with a loan limit of Taka 30,000 ($870) in 1992. Proshika commenced its Small Economic Enterprise Development Program in 1996 with loans as large as Taka 400,000 ($6,700). Other MFIs such as Buro Tangail and TMSS also scaled up their microcredit operations. Brac scaled up chiefly to cater to the needs of its micro-finance graduates. Brac‟s credit programs include Unnoti (loans size $166–$833) and MELA (loans size $580– $5,800) along with the standard microfinance (loans size $17–$345). However, these scaling-ups by MFIs were not large enough to meet the fund requirements of the SMEs. Some specialized financial organizations such as Basic Bank also started providing financial services to the SME sector. Since the SME segment of the market was relatively underserved, a number of formal financial institutions were gradually scaling down and designing financial products for them. The Bangladesh Bank has then started taking a number of policy measures to increase SME access to institutional finance. In Jan 2005, Bangladesh Bank had introduced $16 million refinancing scheme to promote lending to SMEs by banks and financial institutions and made agreement with six banks and eight financial institutions. As a result about 2,000 SMEs have benefited from the scheme up to the end of January.„Small and Medium Enterprise Sector Development Programme‟, a $30 million project of Government of Bangladesh and ADB, is also in progress. Historically, the selection of the size group and activities of Enterprise Financing has been decided in Bangladesh in an arbitrary manner. In all earlier Five Year Plans the emphasis was limited to small and cottage industries (SCI). 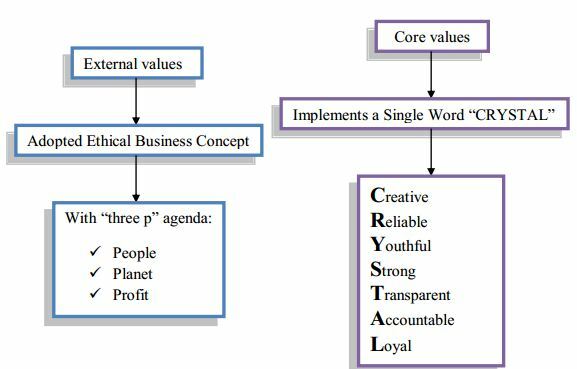 PRS P-I, initiated in 2005, replaced the expression small and cottage industry (SCI) by small and medium enterprises (SME), but did not provide any explanation which raised many problems in understanding this concept. The lack of objective basis in determining the coverage of SME, policy measures aimed at promoting SMEs have often yielded distorted results. The extension of the purview of SME to include non-manufacturing activities has led to large number of trading enterprises of specified size to claim policy support earmarked for SMEs. Therefore, an overwhelming proportion of credit provided to SMEs under Bangladesh Bank’s refinance scheme has gone to the trading sector. There was confusion amongst the policy makers regarding whether micro enterprise (cottage industries and enterprises with less than 10 workers) should be included in the coverage. The success of microfinance for a number of decades has smooth the way for more formalized SME lending in Bangladesh. The interest of the government and regulatory bodies here is also admirable. With establishment of the SME Foundation and incorporation of the SME credit policy and programs by Bangladesh Bank, a new era has been envisioned. It was not until 2010 that the government and policymakers recognized the importance of providing extensive credit facilities to small and medium sector entrepreneurs to promote various initiatives, especially start-up enterprises as well as ones looking to scale up. A special programmes department has been established to promote the SME sector such as SME Foundation. Subsequently, the Department of Banking Inspection-3 was also constituted for onsite supervision of SME-sector credit. SME credit policy and programmes was put in place requiring the banks/non-bank financial institutions to commit adequate fund prioritising the manufacturing and service sector and to ensure increased access of small and women enterprises to institutional finance. Quarterly meetings are arranged at the Bangladesh Bank on a regular basis to review the performance status and corrective measures, if any, taken by the participating banks and non-bank financial institutions under the SME credit policy and programmes. projects. In 2010, 19,194 woman entrepreneurs were provided with SME loans worth Tk. 2,103 crore. It has been focusing on expanding facilities in rural areas and giving loan assistance to traditional industries like handicraft, weaving, pottery and boutique etc. The loans will be mainly given to more than 60 categories of operations in the SME sector such as light engineering, handicraft, flower, fish processing, handloom, rice-mill, Jamdani, Rajshahi silk etc. Road show, trade fairs, workshops and other initiatives were taken to make the bankers, entrepreneurs and other stakeholders aware of the need for easy access of SMEs to institutional finance. BB governor formally handed over sanction letters for loans worth Tk. 4.19 crore to 23 entrepreneurs from across the country. Nineteen banks provided the loans.SME fairs in rural areas and include poultry, fishing and flower farming under the SME category has been planned. The interest rate had already been brought down to support the country’s entrepreneurs but now the government considers a further cut in bank interest rates, especially for small and medium enterprises (SMEs) to help the sector grow faster. Bangladesh Bank has emphasis on cluster and area-approach methods for disbursement of such loans with the aim of easing inflationary pressures on the economy through creation of jobs across the country. country’s $90 billion economy comes from SMEs. Developing countries like China are getting 20 to 30 per cent of their GDP from SMEs whereas this sector in Bangladesh is contributing 25 per cent to GDP with 60 per cent of employment generation As of recent research (Daily Star, 2011), the SMEs account for about 45 percent of manufacturing value addition, 80 percent of industrial employment, 90 percent of total industrial units and about 25 percent of total labor force. Their total contribution to export earnings ranges from 75 percent to 80 percent, according to a recent economic census. The SMEs make up 75 percent of the domestic economy. Bangladesh is a developing nation, rich in human resources where women constitute slightly less than half the population. The majority of them are underprivileged, under nourished, illiterate and poor. Moreover, there are not enough employment opportunities for women. Therefore, economic activities, through self-employment have become essential for potential working women. As a matter of fact, women entrepreneurship or “women in business” has gained importance and acts as a very recent phenomenon in Bangladesh. SMEs can play a significant role in establishing gender equality and bridge the widening the gap between rural and urban income. It is said that introduction of SME to rural areas would result in a large-scale development that would put the country‟s economy in a high growth trajectory. Nationalized Banks, 10 Foreign Banks, 30 NBFIs and 9 Specialized Banks till now. 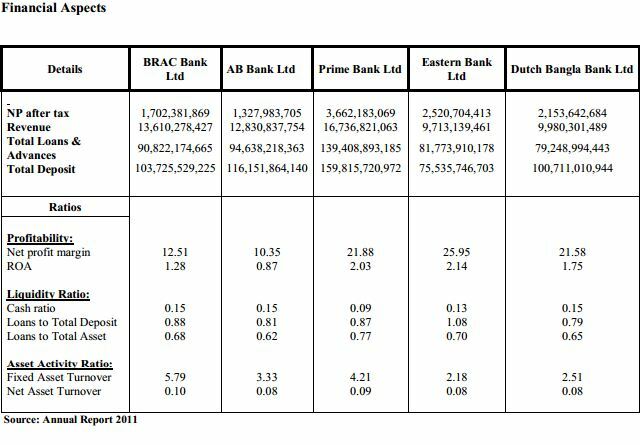 (New Age, 2011) The banks and non-bank financial institutions had a self-fixed target of Tk 38,845.55 crore for disbursement in the SME sector and the total actual disbursement stood at Tk 53,543.98 crore exceeding the target by Tk 14,698.43 crore or by 138 per cent. The total trading sector received Tk 35,040.50 crore which is 66 per cent of the total disbursement. The total manufacturing sector received Tk 15,147.74 crore or 28 per cent. The total service sector received Tk 3,355.68 crore or 6 per cent. The small enterprises received an amount of Tk 23,033.45 crore which is 43 per cent of total disbursement against the set target of 40 per cent. This states that the needy and small entrepreneurs are getting loans. Moreover the women entrepreneurs gained access to finance increasingly in each successive quarter in 2010 which totalled to Tk 1,807.02 crore or 3.38 per cent. The total SME outstanding increased to Tk 69,526.55 crore only in December 2010 from Tk 51,147.58 crore in December 2009 indicating a strong recovery performance during 2010. The central bank had set the target for disbursement of loans at over Tk. 625 billion for the small and medium enterprise (SME) sector for the year 2011 which is a 64.56 per cent increase over that of the previous year. According to the above chart, the private banks has provided SME loan of 63.22% where the target was 72.24%. The state owned banks covered SME loan of 25.68% against the target of 21.58% which indicates an increase. The Non-banking financial institution provided SME loan of 3.10% against the target of 3.62%. The foreign commercial banks and/ or specialized banks had a target of 2.54% and it achieved 2.40%. BRAC Bank was set up with the growing need for capital mobilization and the need for formal contracts for a wider range of clients of the country. When it came to SME financing, instead of approaching the problem by scaling down its regular operations, a separate program designed especially for SME financing was launched by BRAC Bank in 2002. Brac Bank‟s effort is noted in this regard for its complete focus on the credit needs of the small and medium enterprises. 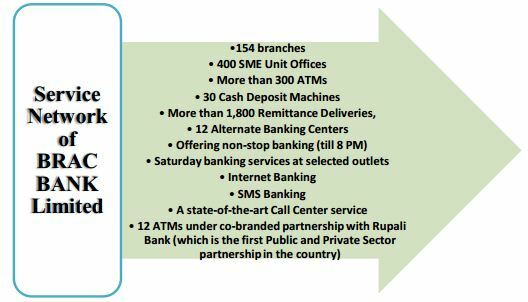 Since the initiation of SME operations by Brac Bank, it has become the Bank‟s largest and most profitable venture. BRAC Bank’s Vision: Remain the leader in SME banking, respected locally and globally while focusing on people, profit, and planet. BRAC Bank SME finances covers a many non-traditional sectors – agriculture, food processing, light engineering, plastic, handicrafts, poultry, dairy, fishery, feed mill, wood processing, boutique & garments, which helps in boosting rural economy and generating employment. BRAC Bank is the only bank in the country to have a plan to disburse near about 70 percent of its loan portfolio to SME. BRAC Bank has achieved 63% growth in SME financing at the end of first six month of 2012. Portfolio at Risk (PAR) has been brought down slightly in 2011 & 2012.
sends a detailed report of the enterprise‟s financial status along with the application to the Head Office for approval. The Head Office seeks clearance from the Credit Information Bureau (CIB) and based on the risk rating, either approves or rejects the loan application. After approval from the Head Office, loan disbursement is carried out between the Head Office and the clients directly through the services of another assigned bank (Pubali Bank, in most cases). opportunities. Many retailers expand business by starting up wholesale transactions as it can be facilitated due to the availability of cash. This allows entrepreneurs to purchase raw materials and goods for sale at lower prices, and also improve their relations with their buyers by offering sales on credit. As a result, Expansion of business and cash purchasing increases which facilitates future business deals. Availability of Deposit Products There are a number of SME deposit products which helps in building saving habit among the small entrepreneurs which is an important factor for their survival at time of difficulty. and 126 zones. The frontline employees of small business are called Customer Relations Officer (CRO). More than 1,100 CROs are working in the department as of June 2012. Small Business department is organized into regions, territories, zones, and unit offices all throughout the country. Historically the department provided small loans to entrepreneurs. Now it is fully equipped to provide all kinds of products and services to small entrepreneurs. It is the biggest department of the division in terms of asset, deposit, and nationwide presence. Medium Business department is currently located in Dhaka and Chittagong city to look after the mid size borrowers of SME Banking arena. It is looked after by Senior Relationship Managers/Relationship Managers. service centres. Among the five banks, only BBL has SME unit offices and none of the banks has it. products which include Current scheme, Savings scheme and fixed deposit scheme. The Current scheme of BBL is known as „Prapti‟ and the current scheme of EBL is known as „Shubidha‟. The Minimum account opening amount of „Shubidha‟ is Tk.100, 000 whereas in „Prapti‟ the requirement is Tk. 2000. 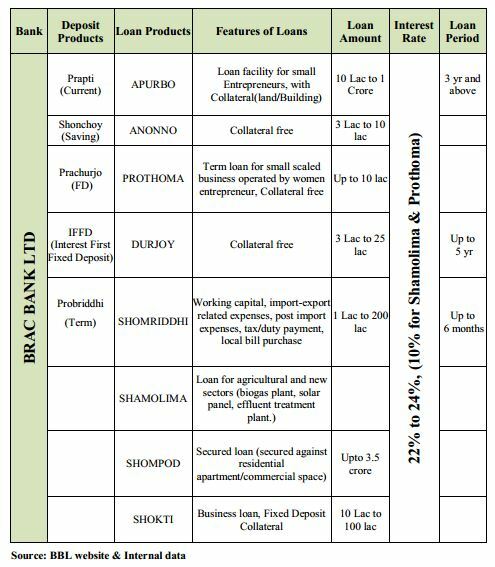 Both „Prapti‟ and „Shubidha‟ has daily interest bearing and BBL gives interest upto 4%. „Shubidha‟ has free monthly statement and half-yearly Statement. On the other hand „Prapti‟ has half yearly statement home delivery system and for cash withdrawal for sole proprietorship, there will be a debit card given while opening the account. The Fixed deposit scheme of BBL is known as „Prachurjo‟ which can be opened with minimum amount of Tk. 50000 for 1 month to 36 month. 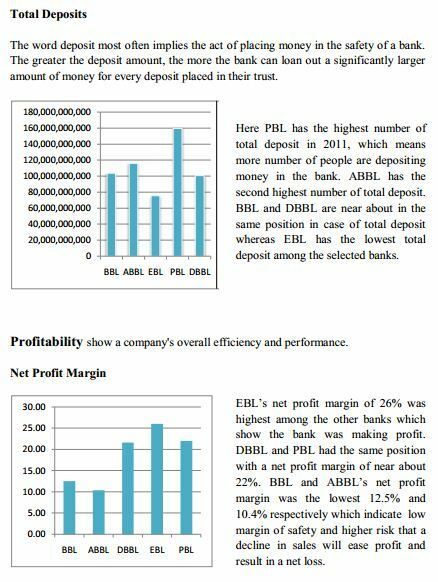 EBL‟s Fixed deposit scheme is known as „SME Double Return‟ which offers double return after 6 years of maturity with minimum account opening of 1 lac. facility. 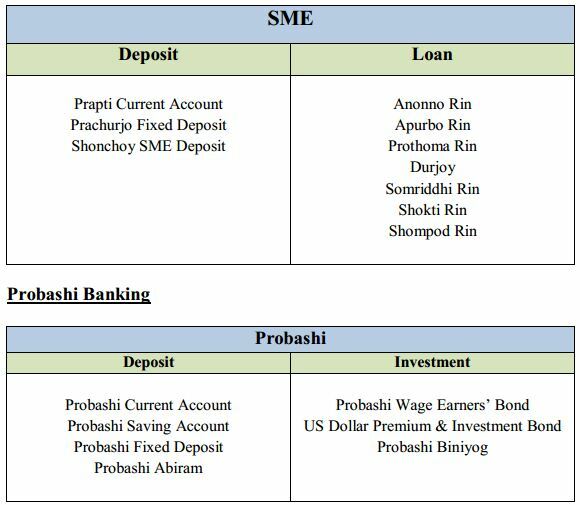 Moreover BBL has 2 more term deposit products which „IFFD‟ and „Probriddhi‟. IFFD is a special product in which interest is paid first when the FD is created. Probridhi is a term deposit which maximizes the return. 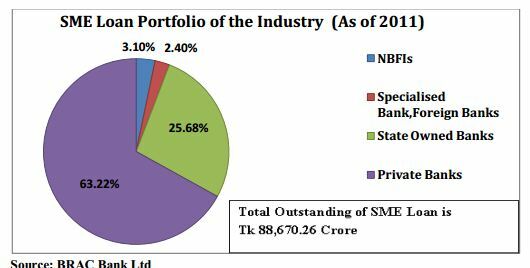 SME Portfolio BBL has the highest SME Loan & advances portfolio size not only among these selected banks but also among other private commercial banks, 50% of its portfolio consists of SMEs and its target is to create a portfolio size of 70%. DBBL has the second highest SME portfolio percentage which is 36%. ABBL has the second highest percentage of SME portfolio among the selected banks which is 32% and its target is to increase the SME portion of loans and advances to 54%. On the other hand EBL and PBL have a SME Loans & advances portion of 15% and 13.5% respectively. The SME loan outstanding till 2011 in case of BBL is the highest with Tk. 4431 crore. The second highest SME loan outstanding bank is DBBL with Tk. 3500 crore. ABBL has the third highest loan outstanding amount of Tk. 3150 crore. 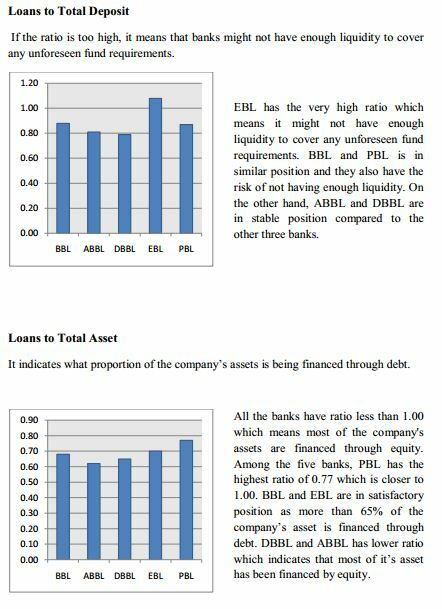 EBL and PBL has the loan outstanding amount of Tk. 2935 crore and Tk. 2100 crore respectively. In case of the number of SME customers, BBL has the highest number with 370000 SME customers. 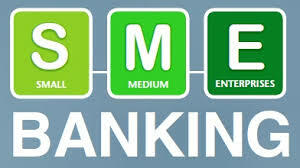 Among the selected banks, DBBL has the second highest SME customer base of 6500. EBL has the third highest number with 5700 SME customers; whereas ABBL and PBL has the customer base of 4300 and 4500 respectively. All the selected banks offer working capital loan, term loan, fixed investment etc but ABBL has different loan scheme for meeting this specific requirement as other banks are not very specific about the loan type and mostly concentrate on working capital. All the selected banks have different types of scheme but among all of them ABBL and PBL offers a special scheme which is Double loan facility. Here, double amount of loan is provided against any savings instrument such as FDR. This helps to avoid encashing long held saving for business required capital. The loan amount range is Tk. 2 lac to Tk. 50 lac in case of PBL and Tk. 10 lac to Tk. 100 lac in case of ABBL. Another special scheme is Seasonal/festival loan which is offered by PBL,EBL and DBBL. The duration is 6 months and it is offered to grab the additional opportunities in various festivals and seasonal events. thousand to Tk. 1.5 lac. 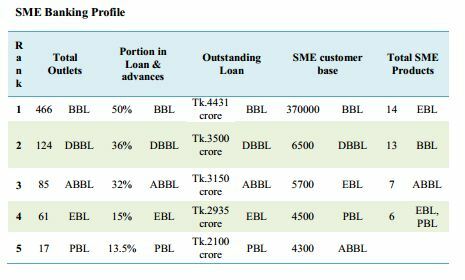 DBBL has a loan range of Tk. 1 lac to Tk. 70 lac. entrepreneur. All the other banks offer collateral free loan of Tk. 2lac to Tk. 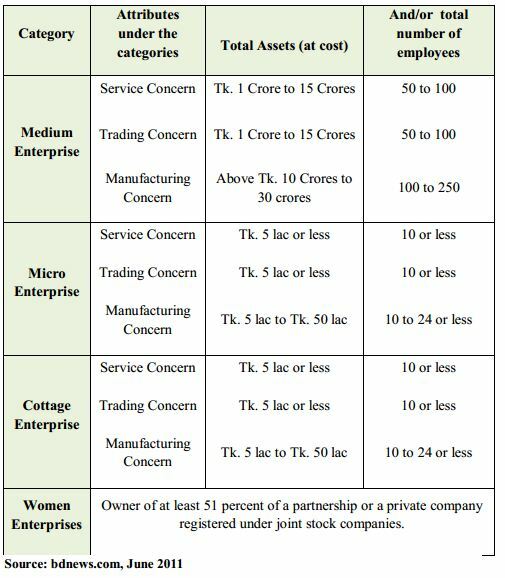 10 lac to SMEs excluding women entrepreneur but only BBL offers the highest collateral free loan amount of Tk. 25 lac. All the banks charge an interest rate of 10% for women entrepreneur. BBL has a 10% interest scheme for agriculture and new sectors (biogas plant, solar panel, effluent treatment plant, etc). EBL also has a 9% interest scheme for leather industry but it is 100% refinanced by SME foundation. Excluding women entrepreneur interest rate, the highest interest rate of 22% to 24% is charged by BBL. PBL‟s SME loan interest rate range is from 17% to 19%; EBL‟s interest rate range is 14% to 19% and ABBL‟s interest rate charged is from 15% to 17%. On the other hand, DBBL is believed to be the lowest interest rate charger as its interest rate lies from 15% to 17% where 15% to 16% is with collateral and 17% is without collateral. Therefore we can see that EBL has variety of interest rates for different loan schemes. 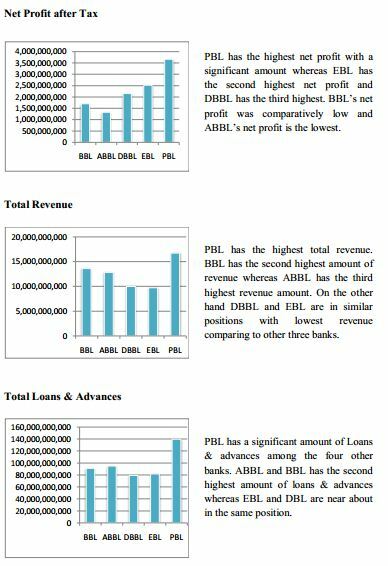 Considering the high loan size of ABBL, it is charging low interest rate comparing to BBL, EBL and PBL. farmers, upto 70 lac to agro based industry and upto 10 lac to leather industry; which is 100% pre-financed by SME foundation and consists of a single digit interest rate of 9%. On the other hand, BBL has a product designed for agricultural and new sectors (biogas plant, solar panel, effluent treatment plant, etc.) with minimum 10% interest rate. manages more customers. PBL is in the last rank in terms on SME outlets and SME Loan & Advances portion as it has only 17 outlets and 13.5% of SME portfolio but in case of outstanding loan and SME customer base it is in a satisfactory standing. DBBL only has loan facility for SMEs but they do not have any deposit facility for SMEs. ABBL has 7 loan products; both PBL and DBBL have 6 loan products. hand, BBL follows standard easy steps but it has a requirement of ownership of property which in many cases cannot be appropriate especially for new entrepreneurs. Among all these five banks DBBL and PBL follows standard and SME friendly Eligibility requirement. Moreover, DBBL wishes to consider SMEs with Fixed capital starting from Tk. 50000 so that more potential entrepreneurs can be provided with finance. BBL should make its product range more attractive like it can include seasonal loan; more collateral free loans which might be of different loan size, loan period etc by this it can attract wider range of SME customers. BBL should give chance to customers who do not have any property instead check their business income or bank balance so that new entrepreneur is encouraged. It should provide loans to the leather and jewelers industry, because leather is the 3rd exporting product as they can contribute towards the economic development of Bangladesh. BRAC Bank Ltd has proved that a bank can value People, Environment and also make Profit. It is famous worldwide for its sustainable banking and its fast movement towards prosperity. BRAC Bank‟s contribution in SME banking is immense and uncompetitive. Being the youngest bank, BRAC Bank has managed to become the largest SME bank in Bangladesh and 4th largest SME bank in the world. Considering the report, BBL has the highest SME outlets, SME portfolio, SME outstanding loan and SME customer base. The findings and analysis shows that other banks are focusing on SMEs and trying to expand their SME portfolio which means in the long run BRAC Bank might have competitors in terms of getting new potential SME customers. ABBL has been providing loans to SMEs from long before and now it has an attractive loan size. DBBL is in a good shape in terms of SME outlets, SME customer base, SME outstanding loan etc. It has standard loan size with attractive features including lowest interest rate whereas EBL has attractive product features like variety of products, varieties of loan size, flexible tenor period etc. On the other hand, PBL needs to focus more on SMEs in order to compete with other banks. In case of SMEs, more doors of finance are being opened for their business prospect and they have more choices in terms of loan varieties, loan size, loan tenor, loan interest rate etc.